It's interesting to see where automakers are placing their chips these days. 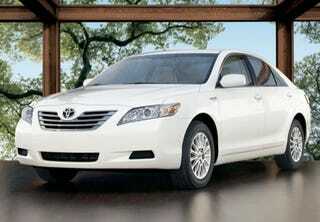 Toyota is expanding production of its popular Toyota Camry Hybrid to Thailand. Toyota wants to break the million mark for annual hybrid sales in the next decade and a way to do that is to start building hybrids in markets with significant demand, including 9,000 hybrid Camrys in Thailand. Let's contrast Toyota's response with GM. The automaker just announced the power numbers on the new Cadillac CTS-V and they just let Hertz fly with their release on the new Corvette ZHZ rent-a-racer. Hmm. We feel like maybe there's a slight difference in PR strategy here — but we can't quite put our finger on it. Press release below the jump. Toyota Camry Hybrid Thailand Production Tokyo — TOYOTA MOTOR CORPORATION (TMC) announced today that, as part of an effort to further popularize hybrid vehicles worldwide, it will begin producing the "Camry Hybrid" at Toyota Motor Thailand Co., Ltd. (TMT), TMC's vehicle production base in Thailand. Production of the Camry Hybrid at TMT's Gateway Plant will commence in 2009, with an annual production target of 9,000 vehicles. "Thailand is the first ASEAN country to build hybrid vehicles. As the Camry has received a warm welcome from Thai customers, we are sure these customers will be satisfied not only with the product but also with its environmental performance", said TMT President Mitsuhiro Sonoda at a joint press conference in Bangkok with Siam Toyota Manufacturing Co., Ltd., attended by Thai government officials. Ever since the introduction in 1997 of the Toyota Prius—the world's first mass-produced gasoline-electric hybrid vehicle—TMC has actively been promoting and popularizing hybrid technology, as part of its high-priority environmental management policy. Toyota aims to sell 1 million or more hybrid vehicles annually as early as possible in the 2010s and is working to establish a worldwide optimal hybrid vehicle production system that reflects market needs.